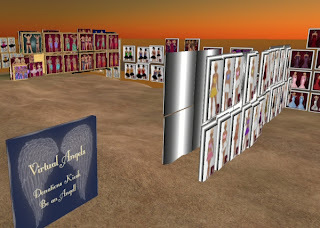 Head on over to the Virtual Angels Yard Sale over in the Useful Technology Sim, and bring a friend or six. They'll thank you. Designer Simone Stern and a group of friends and supporters have been having a charity yard sale to raise money for Ayeshe Millions, who is suffering from an Acoustic Neuroma in RL, and needs to travel to the US for medical treatment. Seemingly acre upon acre of sale items, most of them by Simone Stern, and none of them priced over 100L$. Some of Simone's retired designs are here as well. Skins, jewelry, hair, shoes, even furniture, all under $100L$. I didn't know what the charity part of the yard sale was for, and happened to ask Ayeshe herself about it! 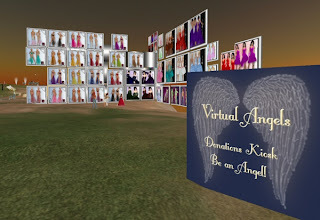 She was very gracious and filled me in on what the Virtual Angels organization and yard sale was all about. Response from the community has been very strong, I've had this landmark handed to me by at least half a dozen people. On occasion, the sim is full, so keep trying! And good luck and good health to Ayeshe!